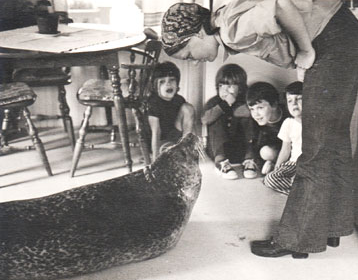 The story of Andre the seal is well known in New England. Now a new PBS program about this harbor seal—and his connection to the New England Aquarium—is airing on Boston's public television station Channel 2 this Wednesday, August 27, at 7:30 p.m. and Saturday, August 30, at 2:30 p.m. Current Marine Mammals Curator Kathy Streeter, current trainer Paul Bradley and retired trainer Annie Potts appear in the program. Tune in to WGBH Channel 2 in Boston during Wednesday evening's broadcast for a special Aquarium perspective from the Director of Media Relations Tony LaCasse! Relationships between wild animals and people have always fascinated us. In the 1970’s and 80’s, the New England Aquarium was home to an amazingly charismatic animal that seemingly bridged the gap between two different species. 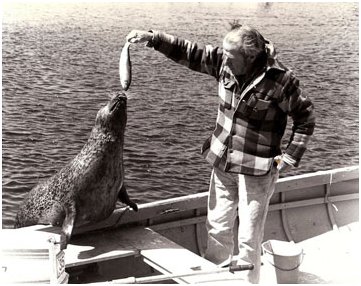 Andre the seal was a male harbor seal that was raised as a pup in the home of an irascible Mainer named Harry Goodridge. Their relationship over 25 years, including nearly 15 years of winters at the New England Aquarium, is the subject of a well-crafted, new PBS program called "The Seal Who Came Home" that will run on WGBH 2 this Wednesday (8/27) at 7:30 p.m. and will re-air Saturday (8/30) at 2:30 p.m..
Andre was taken in as a pup by Harry, which would be illegal now. Since seals in the wild spend prolonged periods of time out of the water, Andre was quite comfortable ambling around the Goodridge home. Home movies shows Andre climbing stairs, playing with Harry’s four daughters and hanging out in the kitchen like the family pet. Instead of walking the dog, the Goodridge household daily routine included time to drive Andre in the family car to the harbor for a swim. As Andre grew into adulthood, Harry was faced with many problems keeping Andre happy and safe. The cold, Maine winters always posed a challenge. 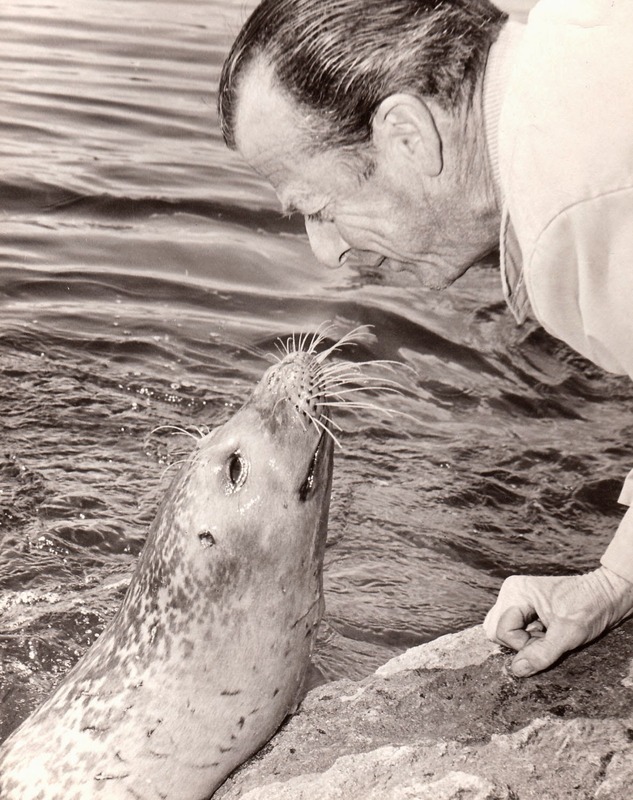 Eventually, Harry struck an unusual bargain with the New England Aquarium where Andre spent the winters in the harbor seal exhibit. Come April, Andre was driven to Marblehead, MA and released. He would then spend a few days to a couple of weeks harbor-hopping his way up the coast until he arrived in Rockport, Maine, his home. This annual migration became a regional ritual and received national media coverage as a harbinger of spring. With his outgoing personality, Andre approached people on the water, interacted with them and then continued on his way. The bond between Andre and Harry was lifelong. Their story reminds us that our relationships with other creatures often makes us better people. If you can't tune in on Wednesday, you can watch the program here. And if you're looking for more about harbor seals and other marine mammals at the Aquarium, click over to the Aquarium's Trainers Blog to learn more about these animals.